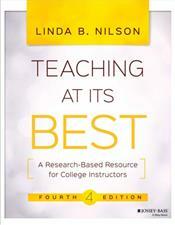 Teaching at Its Best is the bestselling, research-based toolbox for college instructors at any level, in any higher education setting. Packed with practical guidance, proven techniques, and expert perspectives, this book helps instructors improve student learning both face-to-face and online. This new fourth edition features five new chapters on building critical thinking into course design, creating a welcoming classroom environment, helping students learn how to learn, giving and receiving feedback, and teaching in multiple modes, along with the latest research and new questions to facilitate faculty discussion. Topics include new coverage of the flipped classroom, cutting-edge technologies, self-regulated learning, the mental processes involved in learning and memory, and more, in the accessible format and easy-to-understand style that has made this book a much-valued resource among college faculty. Good instructors are always looking for ways to improve student learning. With college classrooms becoming increasingly varied by age, ability, and experience, the need for fresh ideas and techniques has never been greater. This book provides a wealth of research-backed practices that apply across the board.